An online acquaintance/friend posted this on her blog, along with a sad update on her life. I found this quote spoke to me as I read her post because she's really trying to live out the words of this message - despite the unexpected turn in life. I see this sentiment reflected in the lives of others, who are living lives different than they expected. 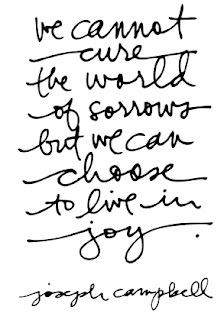 Sometimes we have to choose to find joy in life. I'll be honest, some days - and this weekend is one - I don't know how to do this, except through prayer - and a deep faith that surpasses all understanding - and knowing that there is a God, who loves me. period. 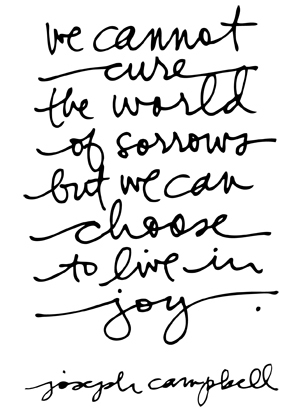 That's my prayer for everyone who may want to "fix" the sorrows, but can only focus on finding joy in life. Maybe that's my word for 2012..... hum....although it was a word I picked in the last few years....... maybe there's still a lesson to learn here.